Le Cirque du Soleil means "The Circus of the Sun", but it is a spectacle that requires no translation. 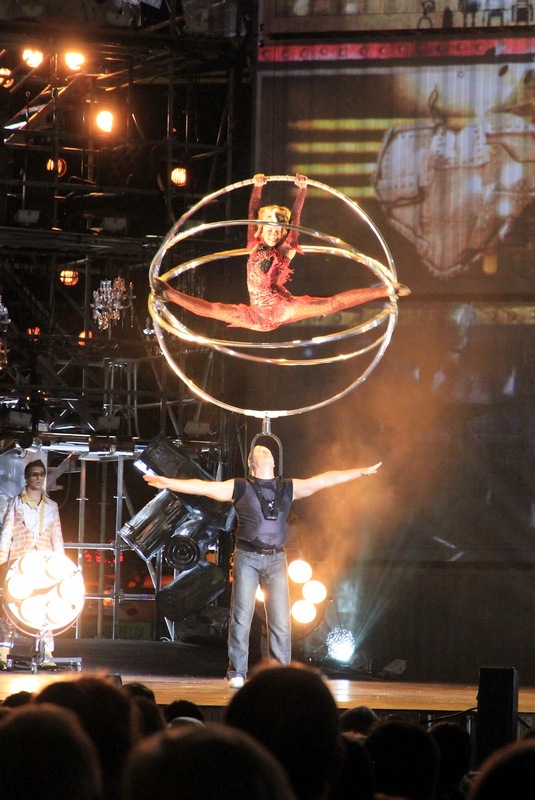 While many readers may recognize this well-known acrobatic show company, you may not be aware that its origins are right here in Quebec City. Music, dance, elaborate costumes and phenomenal choreographed acrobatics are the signature of this troupe, which started out as a handful of young street performers in a village east of the city. In 1984, amid preparations for province-wide celebrations of the 450th anniversary of Jacques Cartier's "discovery" of Canada, the troupe's founder convinced organizers to sponsor the first provincial tour of the Cirque du Soleil. 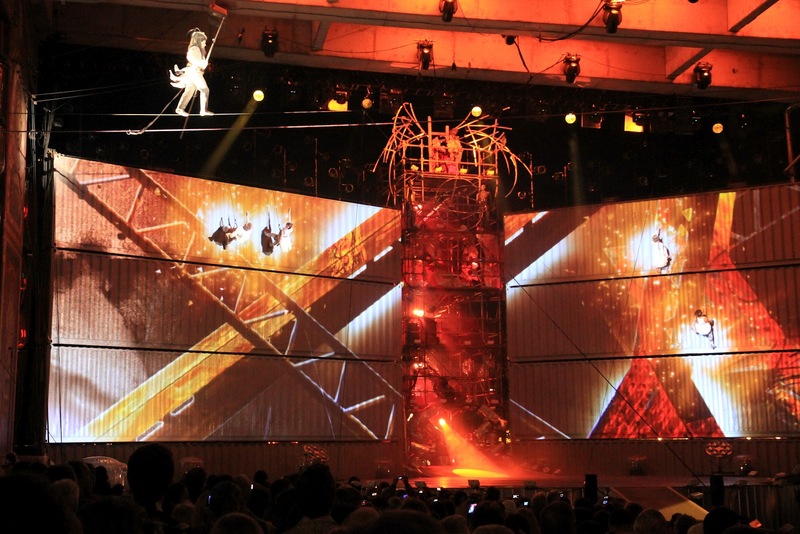 As a nod to its origins, the Cirque du Soleil presents a 2+ month-long series of performances each summer in Quebec City. The outdoor performances are free, and all you have to do is wait in line long enough to get inside the gates. 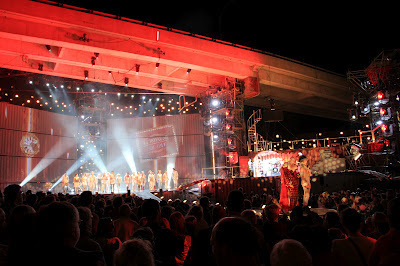 Standing-room only shows are presented at dusk, in an intriguing "no man's land" beneath a stack of freeway overpasses, between the city walls and Quebec's old port. 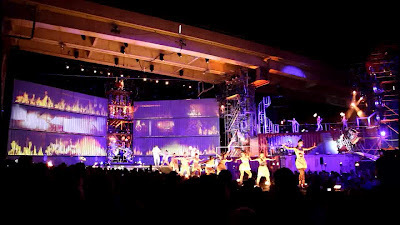 The entire area, typically covered in colorful graffiti, is overhauled, transformed, and becomes a bizarre portal into a world of flying trapeezes, sparkling costumes, pulsing music and fantasy appropriate for all ages. The show, Les Chemins Invisibles (The Invisible Streets), is in its third year. This year's "chapter", Le Royaume de Tôle (The Tin Kingdom) played from June 24 to September 3. We waited until the end of the summer, went with friends, and relished the warm summer air and general joie de vivre of the audience. We will certainly go again next summer. Earlier, and at least twice. Next time, we'll go once to watch, and again to take photos. It is nearly impossible to do both at the same time. **Thanks to Mathieu Basille for all the photographs in this post. See more from this show on his site. NOTE: All his photos are covered by a Free Art License. Please respect his stipulations for use, as explained by the license. PS : tellement vrai aussi, comment profiter d'un spectacle comme il faut d'un spectacle avec un appareil photo en mains ? Très difficile, surtout quand il s'agit de spectacles fugaces et uniques (une acrobatie par exemple, mais aussi une observation de baleine ou bien un sourire volé).